Sir Granthon Gristlethwaite III is the richest lion on the Savannah, thanks to his empire of gazelle meat-based fast food chains. Click here to play! Sure, there have been some damning documentaries from other lions in recent years suggesting that the food these restaurants serve is unhealthy, but profits haven't been affected much. Nevertheless, Gristlethwaite the lion is selling off some of his stake in the business, to avoid going down with the ship. 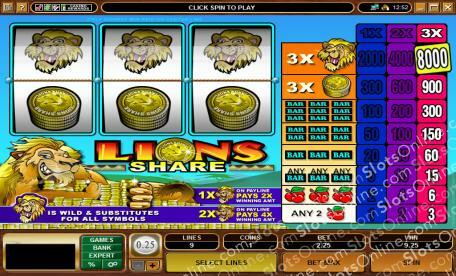 In the Lions Share slots, you must help the richest lion on the Savannah to maintain his fortune by lining up Lion symbols and money symbols. By doing so, Gristlethwaite will reward you handsomely with big jackpot prizes. There's only so much time until the animals find out he’s been using hyena meat instead of gazelle, however, so you’d best get over to the Lions Share slots fast. The Lion symbol is wild, and it can substitute for any other symbol. It doubles wins for lines where it substitutes for one symbol, and quadruples wins for line where it substitutes for two symbols.